On Tuesday night I went to a Colgate event at London's Ice Tank Studios, where they had transformed it into an intimate restaurant for the evening. 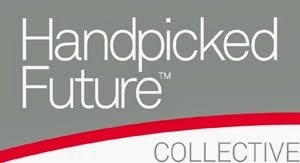 All I had been told was that it was going to be a very special event involving a teeth-tingling meal cooked by award winning molecular chef, Sean Wilkinson that was inspired by fire and ice. As a sufferer of sensitive teeth it sounded interesting, but also a little scary! Our places for dinner not only had all the normal things you would expect... but a tube of Colgate Sensitive Pro Relief and a cotton bud at it too. Colgate's scientific advisor, Anousheh Alavi, had a chat with us to explain that lots of things can be the cause of sensitive teeth - rich foods, wine, and acidic healthy foods and drink are all big offenders, so foodies are often the worst hit. Enamel erosion and / or receding gums expose thousands of microscopic channels that lead to the nerve-centre of the tooth, so when they make contact with something cold, hot, sweet, or acidic, the exposed channels carry the sensation to the nerve of the tooth, causing pain. We were invited to have a glass of ice cold water, which, of course, set off everyone's sensitivity. 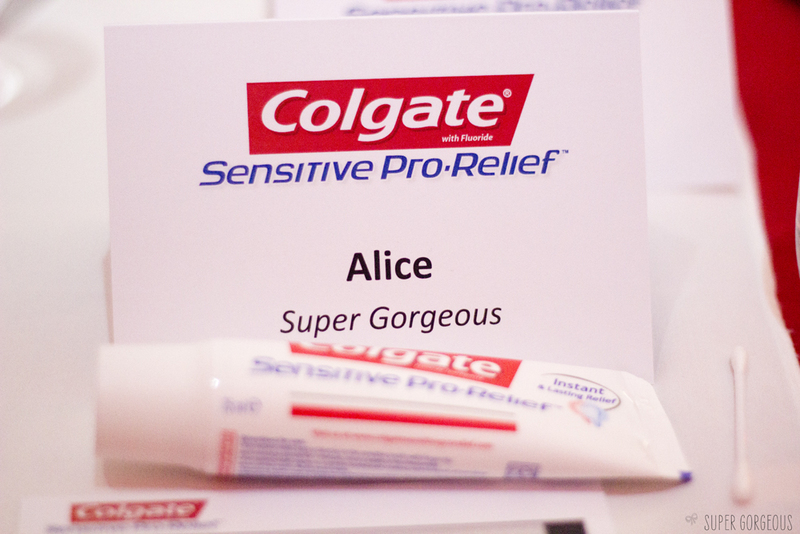 We were told to feel exactly which teeth felt painful, then to rub, for a minute, the Colgate Sensitive Pro Relief onto those areas. Once I'd applied it to the teeth I felt the sensitivity in, I tried the water again - and I experienced no pain. At all. Magical! Once everyone had the relevant teeth covered, it was on to the meal. 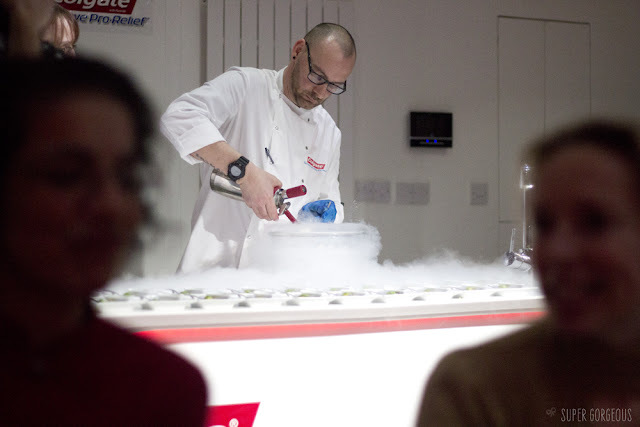 Sean had created a menu to target different triggers of sensitivity, starting with a course cooked in freezing liquid nitrogen - this was definitely a challenge! It was 'nitro-foam of passionfruit and lemongrass dust' - a gorgeously, crisp, cold taste of tropical meringue that made me want more. Unfortunately it was just to cleanse the palette before the meal - I could have eaten a big bowl of it! The spoon had orange flavoured beads on it, and a basil leaf - all the flavours complimented each other perfectly, and surprisingly to me - I experienced no sensitivity. 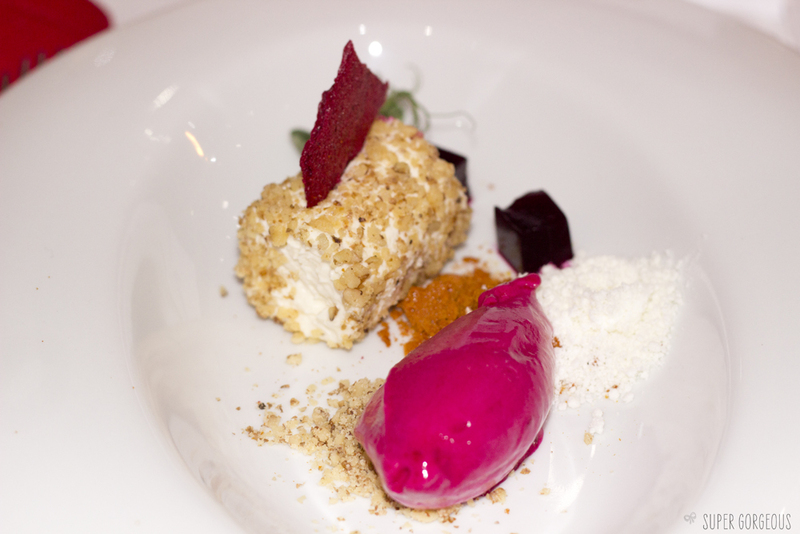 The next course was 'beetroot cinder toffee, goats cheese snowflakes, walnut cannelloni and pumpkin seeds'. I cannot begin to tell you how gorgeous this was. I don't really like goats cheese but this was divine - the purple blob you can see was sobert-like, but much more creamy, and tasted of beetroot. 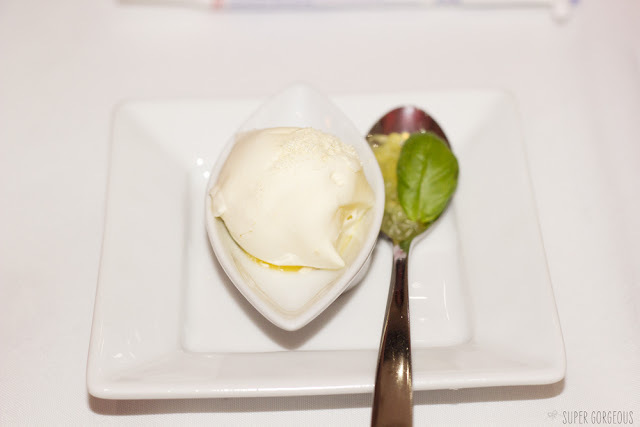 The 'cannelloni' was a soft goats cheese mousse with a walnut crumb. The orange part tasted just like toffee, but was beetroot. The cubes were beetroot flavoured jelly, and the white powder was goats cheese too. Just looking at the photo is making me want is again, and happy to report, still no sensitivity. 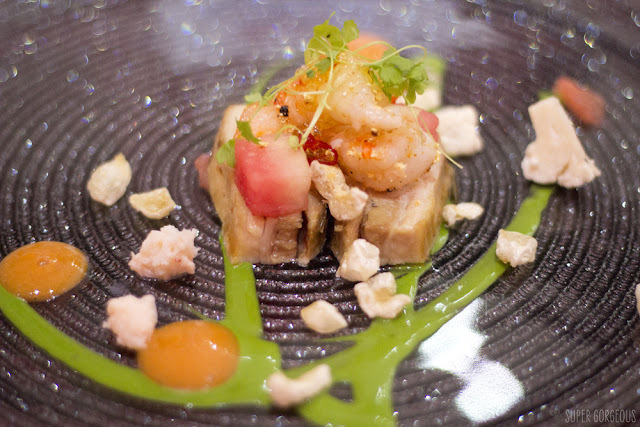 The main course was 'crispy pork skin, candied belly, grapefruit, lobster' - Sean's take on the surf and turf which had pork belly that had been cooked in a water bath for the entire day - it was so soft and tender and delicious. It had on it lobster, carpaccio, and had a vanilla oil and carrot juice dotted around the plate, with chilli pork crackling which had been made with zero pork, but tasted just like pork, and pickled cauliflower, to add to the acidity rating. Again, my teeth were fine. I was quite upset when it came to dessert as I knew the meal would nearly be over and I really didn't want it to end. 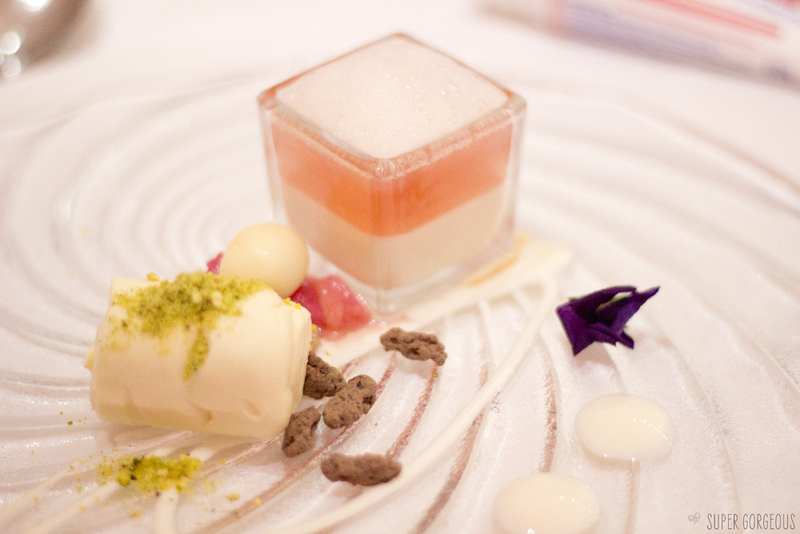 The pudding didn't disappoint - 'rhubarb, frozen yoghurt powder, consommé, pistachio glass' - was again, beautiful. The frozen rhubarb delice tasted like rhubarb and custard, and the pistachio popping candy sprinkled on the top gave it an interesting edge and much amusement round the table. I drank the little glass pot which was warm vanilla jelly with a semi-frozen consommé on top and hot frozen yoghurt powder, making sure to scrape out any of the vanilla jelly that was left. The chocolate covered goji berries were something I've never had before but really nice.... and I was loving it all so much that I ate the flower too. It tasted... floral! The toothpaste is only £3.56, which, for so much of a difference, is definitely a worthwhile investment. Colgate have some sensory recipes on their website if you would like to take the challenge for yourself, you can download them at www.colgatesensitiveprorelief.co.uk make sure you let me know how you get on!